I am a stay-at-home mom. There is a misconception that mothers who are staying at home with their child/children have a lot of time on their hands. That is not true especially if there is no kasambahay (helper) around the house. But lack of time is no excuse to deglamorize yourself. The secret lies on the range of beauty products that you should use. For a quick and easy makeup routine, I only need 10 minutes and nothing more! 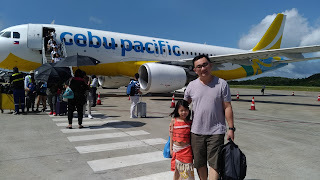 In the morning, I have about 20-30 minutes depending on the time I woke up to make the bed, wash the feeding bottles used the night before, set my daughter's school uniform on my bed, take a bath and put on a little makeup before I wake up my little girl and get her ready to go to school. 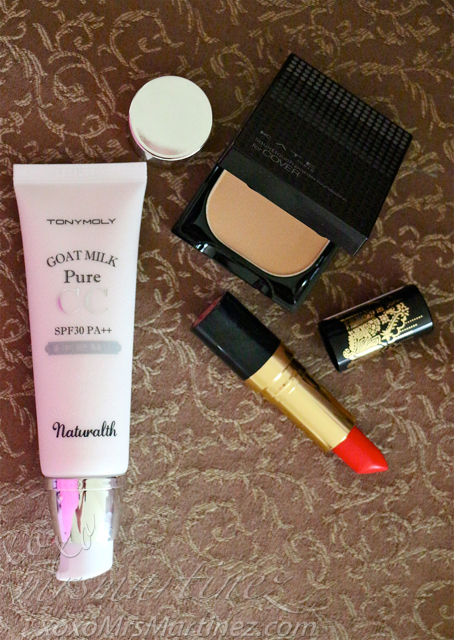 The following are the makeup products I use practically every single day. It works for me, I hope it can work out well for you too. After eyebrow application (read eyebrow tutorial here), I apply 1-2 pumps of TonyMoly Naturalth Goat Milk Pure CC SPF 30PA++ on my face as my base makeup. 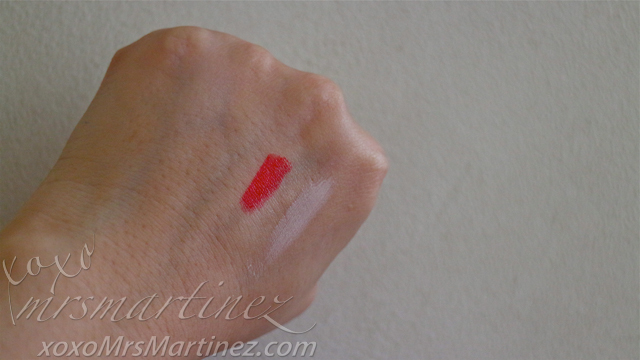 I add a few dots on my forehead, nose, cheeks and chin then carefully spreading the product outwards with my fingers. I make sure to blend it well so as not to leave streak marks on my face. Naturalth Goat Milk Pure CC is a 2-in-1 product- a BB Cream and a skin care, perfect for my busy lifestyle. One tube is filled with 30% Goat Milk extract from New Zealand that acts as a moisturizer and skin brightener, Tamanu Oil to achieve moisturized, glowing skin, Honey and Agave to keep makeup coverage last for long hours. Best of all, it has SPF 30PA++ for sun protection. I love Naturalth Goat Milk Pure CC because it reflects light and therefore improves my skin tone. It also brightens and smooths my skin. The shade is pinkish which blended with the color of my skin. Also available in Beige Milk (02). 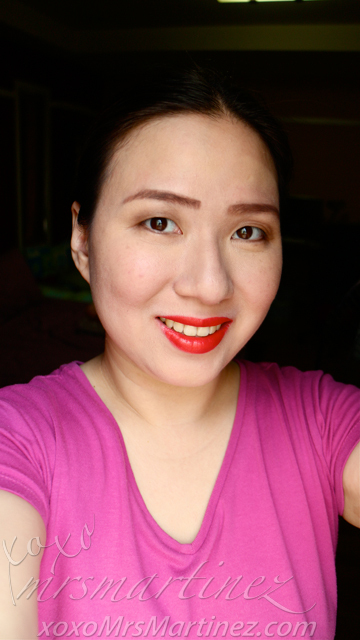 I am currently into red lipstick, my passion with this shade started with Mac lip pencil in Cherry. 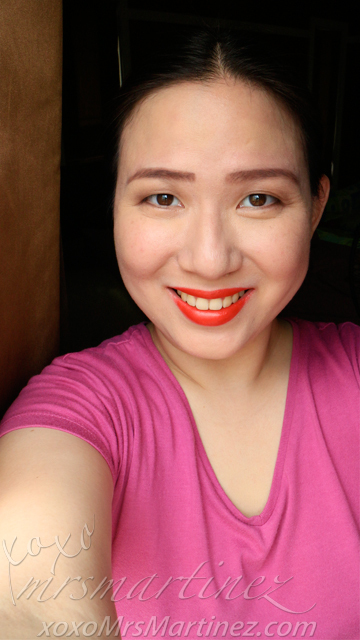 Love That Red from Revlon is vibrant pink/red lipstick. It is rich, creamy and non-drying. Best of all, it stays on for hours minus the retouch. Love That Red is opaque so one swipe is enough to achieve its color... I love it! Effortless! For the final touch, I apply my favorite Japanese makeup brand, Kate Tokyo Liquid Touch Powder Foundation for Cover. The package comes with a sponge but I am more accustomed with using a brush as applicator. It's way more faster and easier to use a brush since I am always in a hurry. Of course, the sponge is very handy and practical in case you want to use this product as foundation for full makeup coverage. Dampen the sponge with clean water then wring the water out. Gently dab the sponge on the product and apply on bare face. Argan oil is a highly recognized beauty ingredient because it can moisturize, strengthen and protect your hair from further damage. It also promotes healthy hair regrowth and is particularly beneficial for those who have damaged, color-treated, or straightened hair. For more information on Naturalth Goat Milk Pure CC and Make HD, visit www.tonymoly.ph or connect with them @tonymolyph. 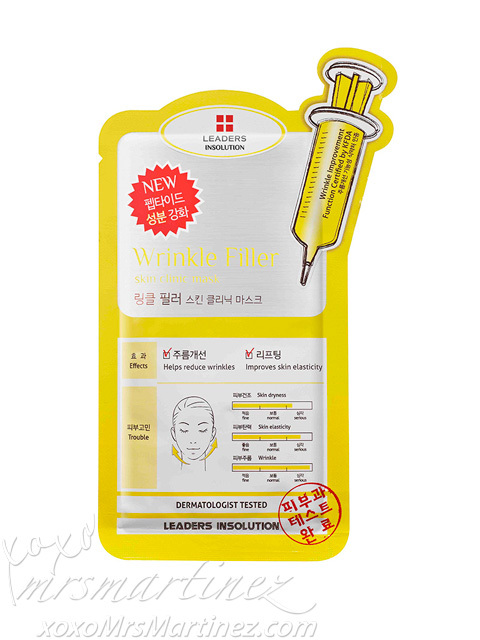 Anyway, better safe than sorry so I tried using Wrinkle Filler Skin Clinic Mask today. According to the package, this mask reduces the signs of aging around the eye area, forehead and mouth. It contains peptides which efficiently diminish fine lines, collagen production is also increased to achieve firmer, younger and more resilient skin. I still have the mask on as I am typing this entry. I can feel the tightening of my face. It must be one of the effects of this mask. By the way, I only get the chance to wear mask when my daughter takes her nap. She is afraid to look at me and would cry every time she sees me wearing one. I can't wait to see the result after 20 minutes! Also available in AC Dressing Skin Clinic Mask (Php 148) for troubled skin with sebum, acne, large pores, irritation and redness.